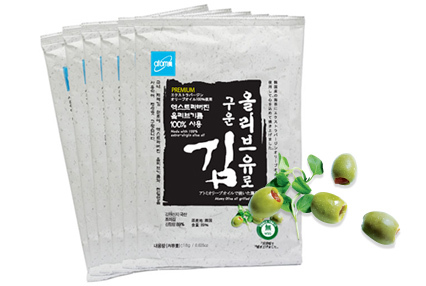 Ingredients : Laver(100% Koran)89%, Olive Oil(made in Spain)7.5%, Salt(100% sea salt-Korean)3.5% Keep in a cool place, avoid exposure to direct sunlight, humidity, and high temperature. Seal promptly once opened. Domestic Seaweed Cultivated in the Shinan waters using eco-friendly electrolytic manipulation, without organic acid processing. Olive Oil 100% extra-virgin olive oil which contains more single unsaturated fatty acids than general oils. Sea Salt Shinan sea salt with rich minerals, without adding chemical additives like L-glutamic sodium, for your health and safety. Cultivated in the Shinan waters using eco-friendly electrolytic manipulation, without organic acid. What does that mean? Electrolytic manipulation was developed to eliminate green algae in the laver farm, and prevent and cure laver disease. It is a system that generates strongly acid electro-analysised water by electrolyzing seawater. Because the strongly acid electro-analysised water is saturated with hydrogen ion(H+) and deficient in electrons, when it touches bacteria that has a characteristic of maintaining equilibrium(laver disease bacteria, bird cell, sea-waste on laver), the bacteria are killed. Atomy uses 100% extra-virgin olive oil, which contains more single unsaturated fatty acids than general oils. With only one compression, using unheated oils and a low-temperature compression method, Atomy laver has the perfect taste and fragrance, with less than 1% acidity. Atomy uses Shinan sea salt containing rich minerals, and does not use chemical additives like L-glutamic sodium (No MSG), for your health and safety.